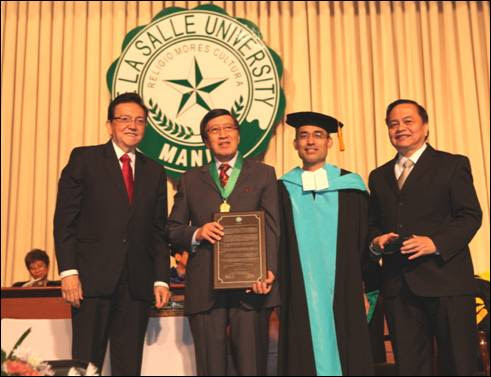 THE Metrobank Foundation Inc. (MBFI) was conferred the Signum Ministerii Medal (Model of Outstanding Leadership in Corporate Sustainability and Responsibility) by De La Salle University (DLSU) last February 16 during the latter's Commencement Exercises held at the Philippine International Convention Center, Pasay City. The Signum Ministerii Medal means "Sign of Service" and is an award granted by DLSU to outstanding social agencies for significant service rendered to the country and to Philippine society. "At the time the first award was given, it was the intention of the administrators and the Board of Trustees then to make awards to deserving agencies (in contradiction to individuals) and from this point of view, the award seeks to accomplish the same form of recognition that the Ramon Magsaysay Awards do. Thus, the award was meant for organizations such as religious orders, institutions such as schools and universities, non-government organizations, which have rendered services to the community," as published by DLSU in its "Honors at DLSU Manila." There have been only two recipients of the award: Radio Veritas (1983) and Namfrel (1984). It is only now that DLSU is awarding after almost three decades, making MBFI as the first corporate philanthropic foundation to receive the distinguished citation. Specifically, it recognized the foundation's various programs and accomplishments on the promotion of a culture of excellence and improvement of the quality of life among Filipinos. The foundation's flagship programs that strengthen and advance key pillars of the society and the institutions they represent were honored. These programs include the Search for Outstanding Teachers (SOT); Metrobank Art & Design Excellence (Made); The Outstanding Philippine Soldiers (Tops); Country's Outstanding Police Officers in Service (Cops); Metrobank-MTAP-DepEd Math Challenge (MMC); College Scholarship Programs (CSP); and the Metrobank Foundation Professorial Chair in the Judiciary. The award also acknowledged the thrust of the foundation in social development extending grants to socio-civic, NGOs, and government agencies focusing on the attainment of the Millennium Development Goals (MDGs). Its healthcare thrust, through the Manila Doctors Hospital, was also highlighted supporting the hospital's operations and corporate social responsibility programs such as subsidies for in-house patients, outreach activities and medical missions, and healthcare interventions in adopted communities. "We receive it with a deep sense of responsibility to continue pursuing excellence that benefits our countrymen," expressed MBFI president Aniceto M. Sobrepeña. "You have appended it to our name by this award and it will remain part of our DNA as it was determined by our founder and chairman Dr. George S.K. Ty at our inception. While it was not our intent to reap recognition, your affirmation is an acknowledgement that encourages us. You also honor our mother institution, the Metrobank, which is celebrating 50 years of service to our banking community" he added. Metrobank Group chairman Dr. George S.K. Ty personally accepted the award from DLSU president and Chancellor Br. Ricardo P. Laguda, FSC, DLSU Board of Trustees Chairman Jose T. Pardo, and Department of Education Secretary Br. Armin Luistro. "I am pleased that this and other recognitions validate our contributions in social development and the promotion of excellence among key sectors of our society," said Dr. Ty. "These public acclamations encourage us to continue contributing to nation-building through our core programs."